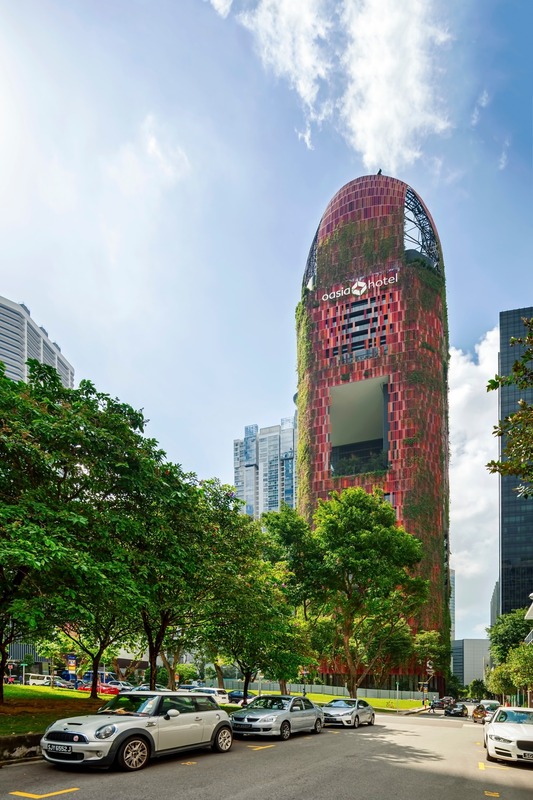 The Oasia is, like the majority of WOHA’s work, located in Singapore. 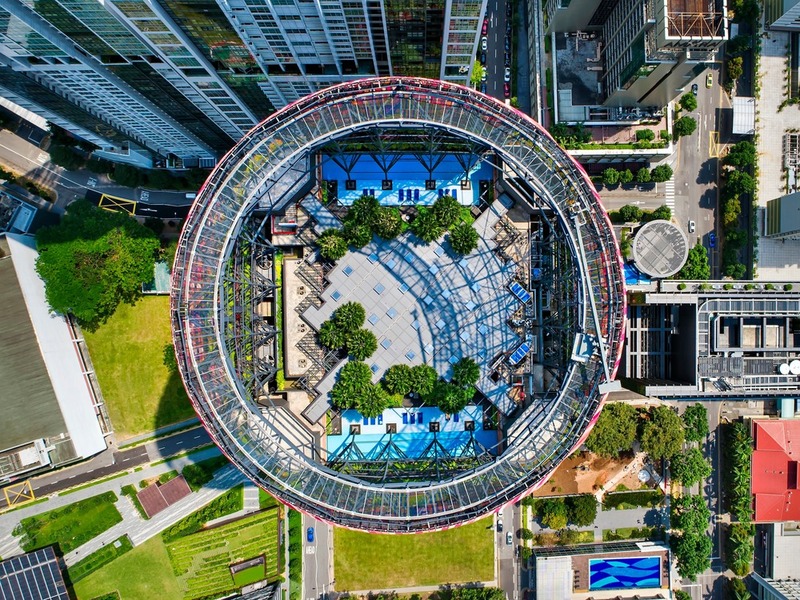 WOHA was founded in 1994 by Singaporean Wong Mun Summ in partnership with Richard Hassell, who hails from Australia and moved to Singapore in 1989. 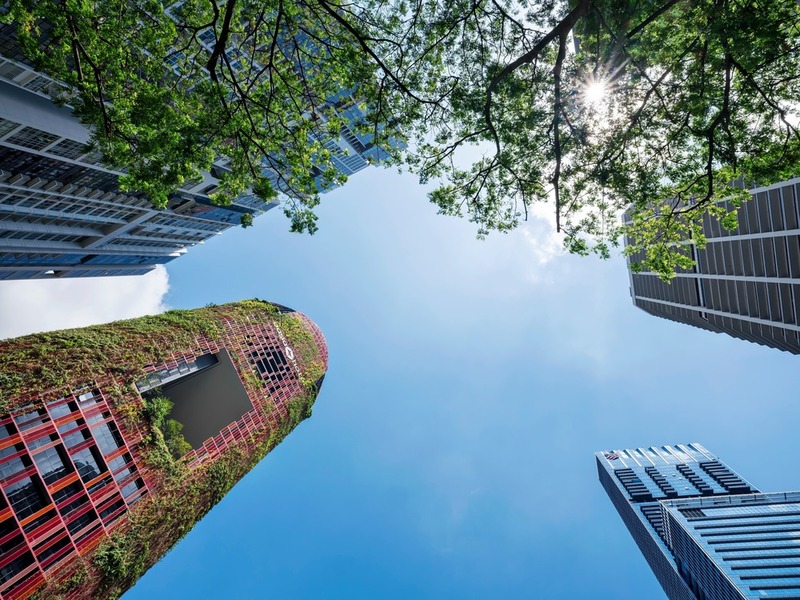 While the pursuit of sustainability is often accompanied by humourless earnestness, WOHA shows that it prefers to stand apart. 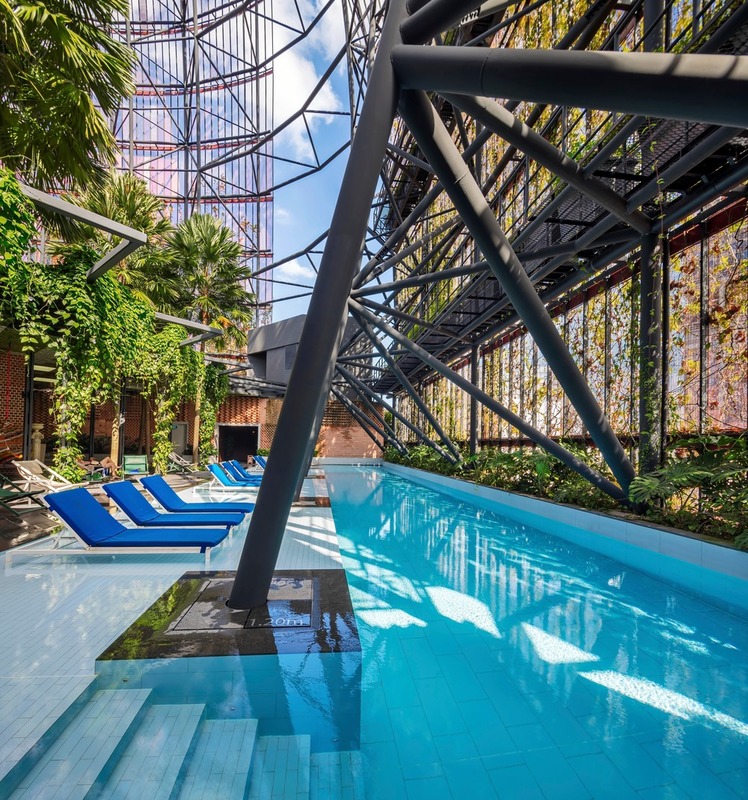 This Oasia Hotel, which is part of an eponymous chain, combines sustainability with delight, two terms that are prominently present in the office’s design philosophy. 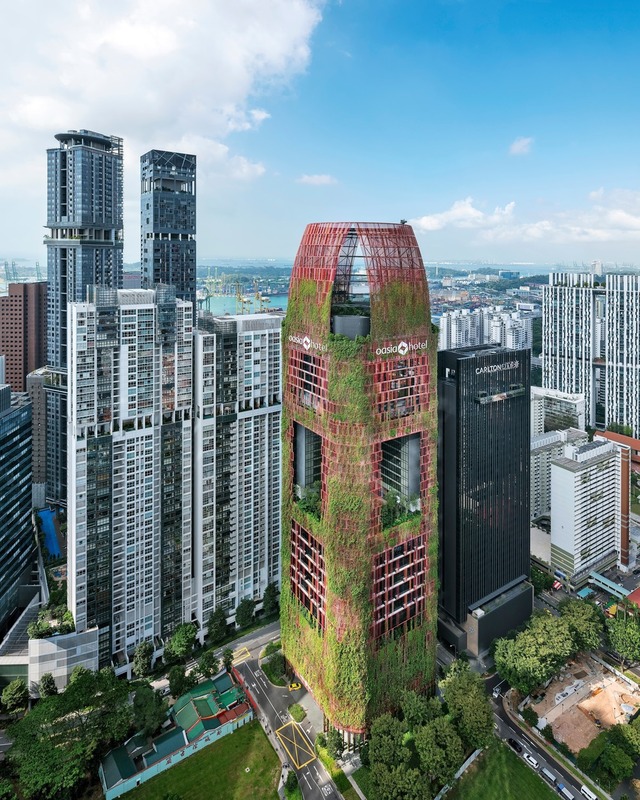 Aside from the red façade – soon to be completely green – the sky gardens also offer greenery, fresh air, and opportunities for natural cross-ventilation, as well as representing the most visibly sustainable and delightful, aspects of the building. 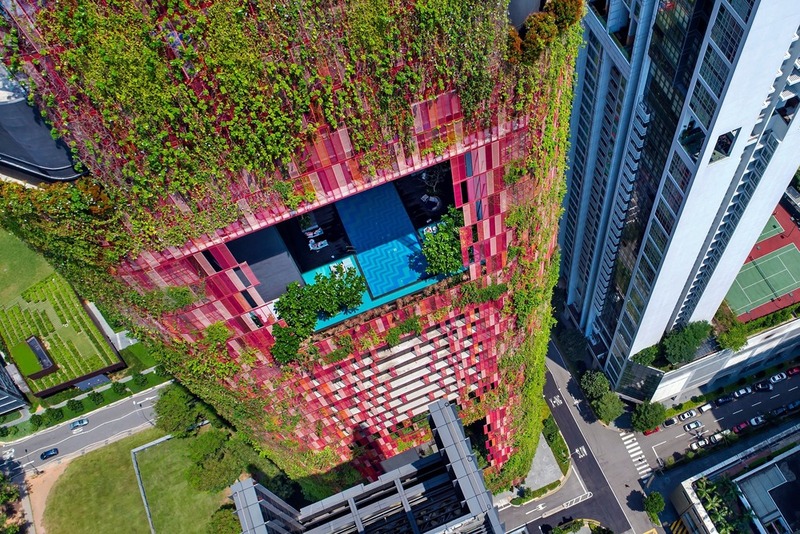 While WOHA can be credited for the architecture of the tower itself and the concept of stacking layers, the actual design of the sky gardens is the work of Spanish designer and architect Patricia Urquiola, who was responsible for all interiors as well as the outdoor spaces of the hotel. 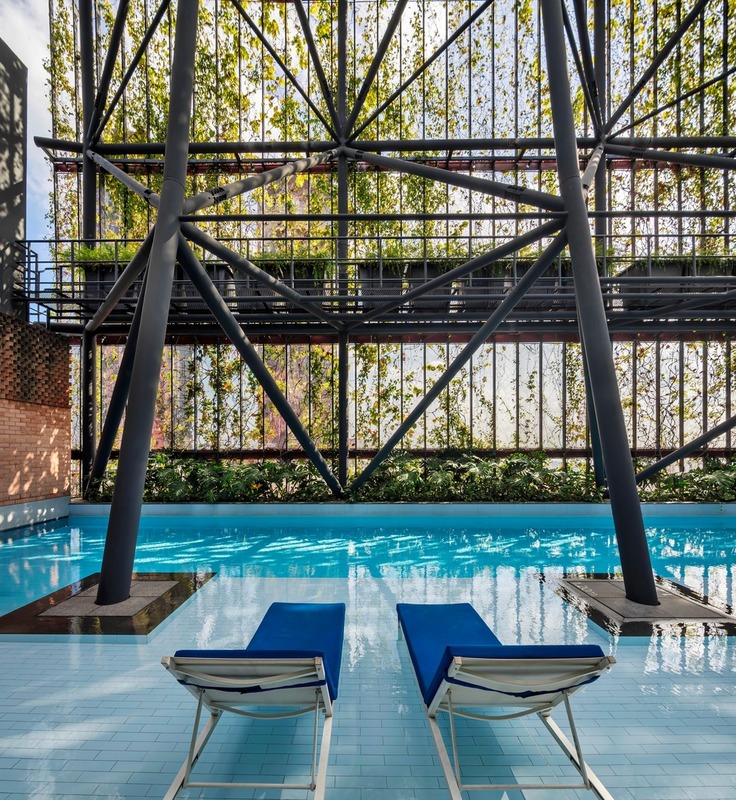 Urquiola adds a breezy elegance to WOHA’s delightfully quirky architecture. 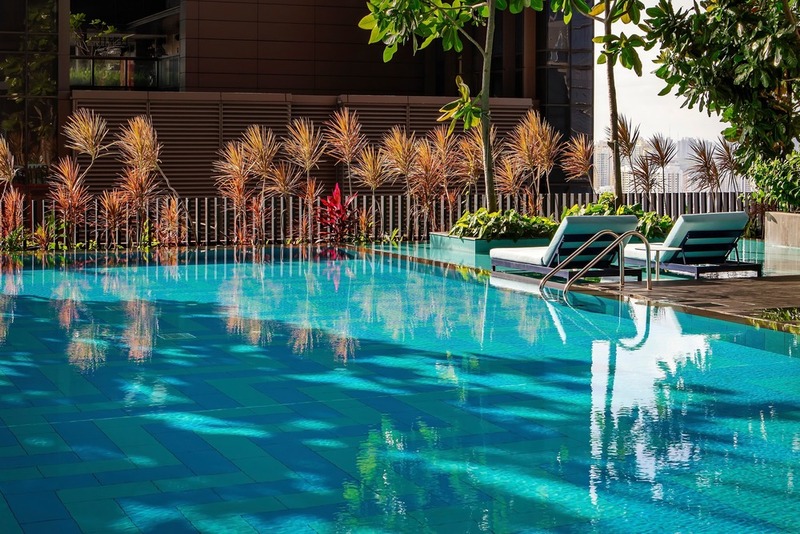 For the pools on the 21st and 27th floor, she has used AGROB BUCHTAL tiles from the Chroma series. 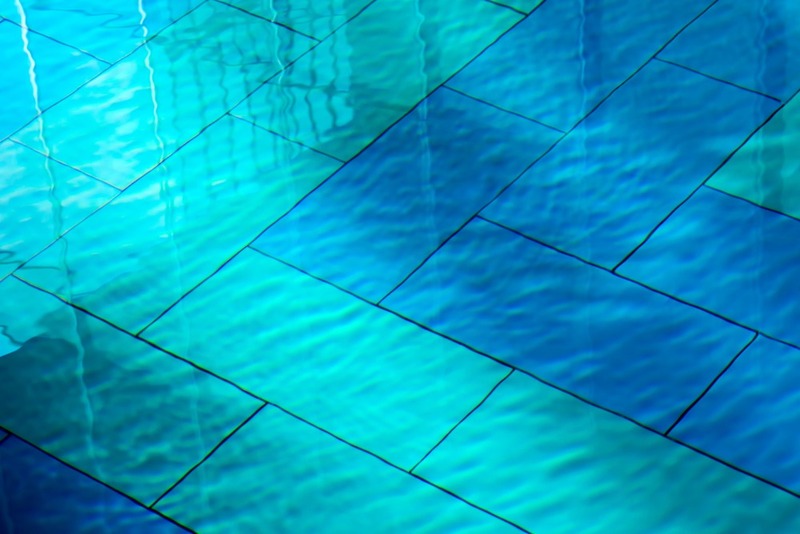 Each pool has a different character. 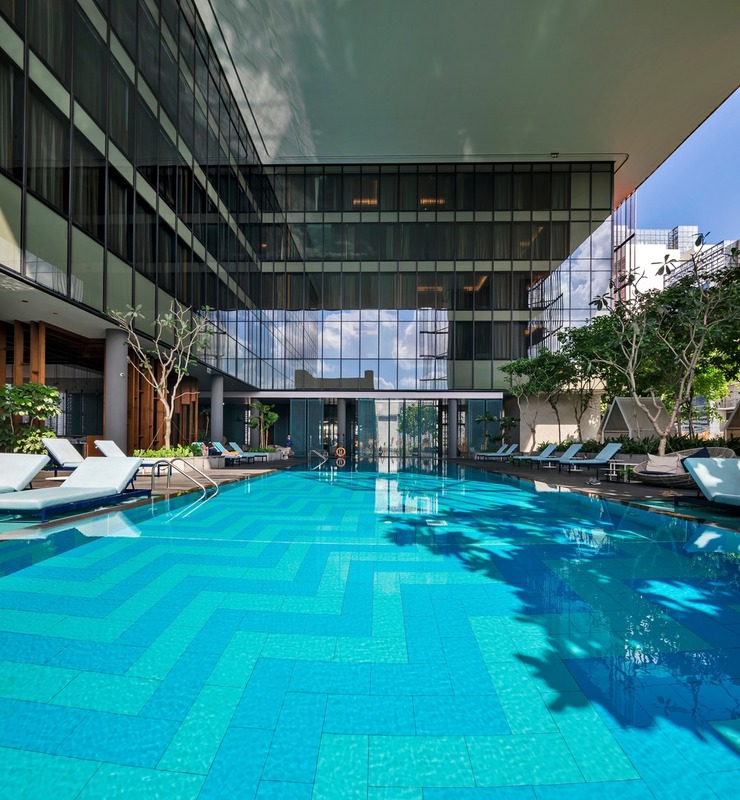 The pool on the sixth floor is part of a gym; on the 21th floor, the pool acts as a stylish extension of the lounge club. 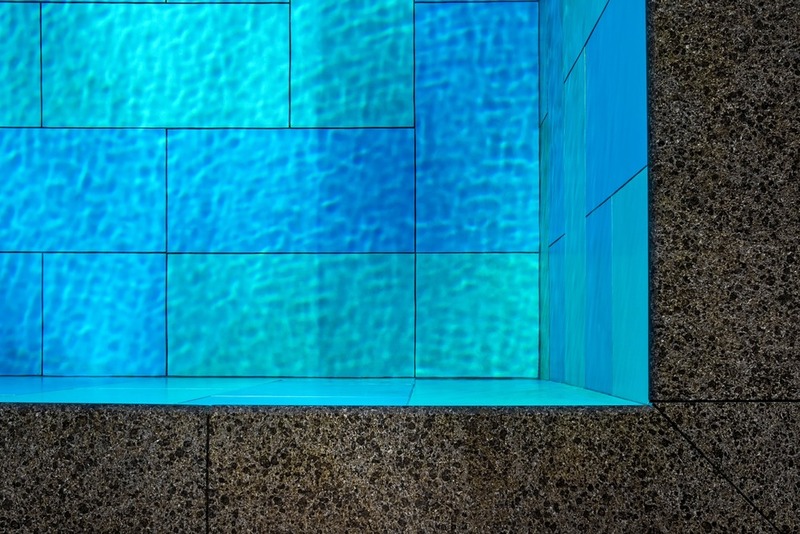 Left and right of the pool itself, which is tiled in a light and dark blue chevron pattern, is a wading pool, just deep enough to get your feet wet while sipping a cocktail. 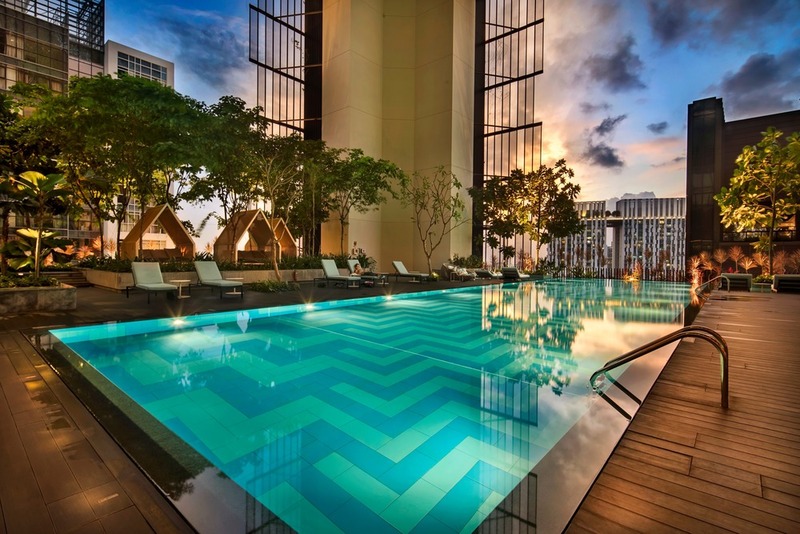 The rooftop pool consists of two parts, on either side of the rooftop restaurant. 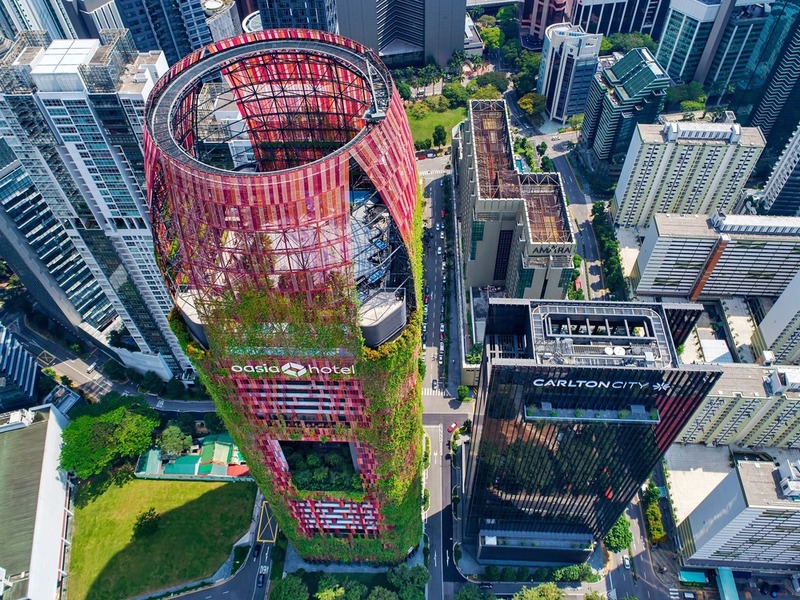 Unlike most rooftop amenities in hotels, which are all about the panorama, here the city’s skyline is almost completely concealed by the vegetated screen. This underlines the unconventionality of WOHA’s architecture. 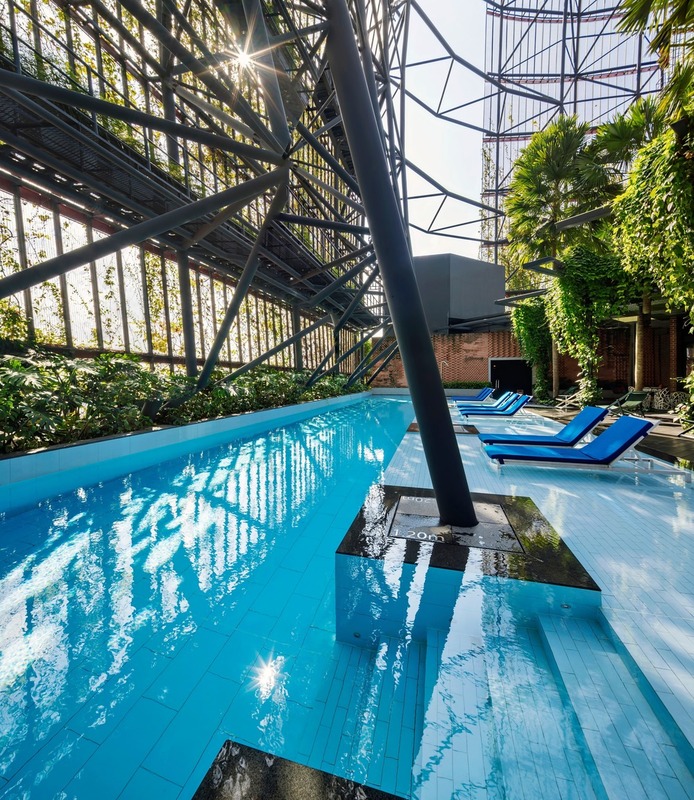 Instead of a view, this rooftop offers a place of unexpected intimacy and tranquillity, a surprisingly oasitic escape from the bustle of the city. 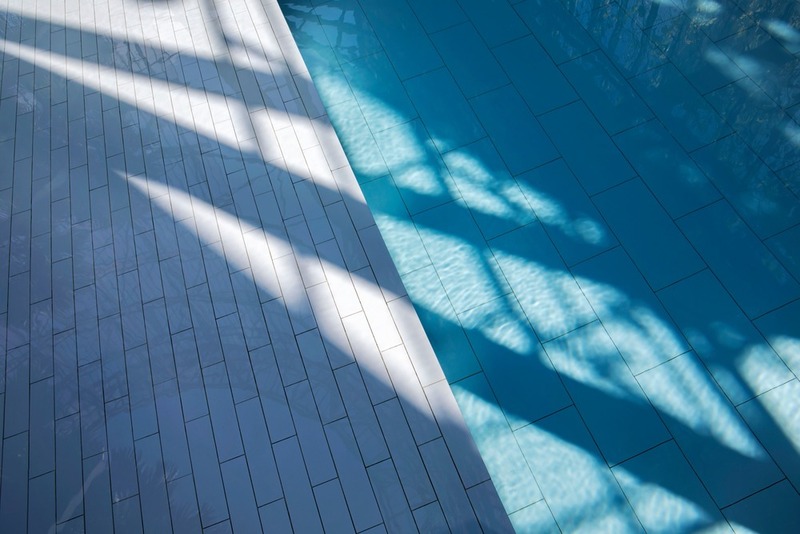 As a specialist in architectural ceramics, AGROB BUCHTAL offers an extensive portfolio of products and services for contemporary and forward-looking building and design using ceramics. The company’s history dates back into the 18th century. Today, AGROB BUCHTAL is a global player firmly rooted in Germany. 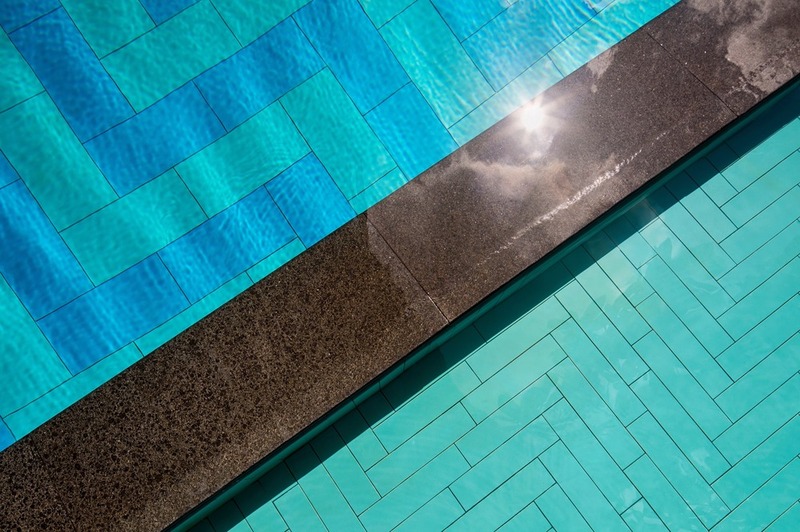 The richly-varied tile collections and special tailored solutions are used all over the world – on the facade of a prize-winning residential complex in London or on the roof of the Museum of Cultures in Basle, in a swimming pool in Shenzhen, on a promenade in Abu Dhabi or in Munich’s underground railway network.